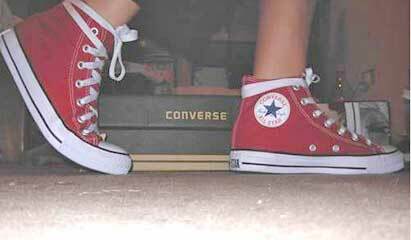 Luckily, The ChucksConnection has been able to locate shoelaces that match the classic tubular style of the original with the same stretchability and length that chucks wearers enjoyed before the nineties. The main different these days is that shoelaces are now mostly made with polyester or polyester blends instead of cotton. 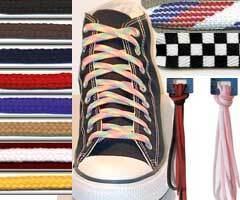 The classic shoelace is our most popular model and looks great on all pairs of chucks or other athletic shoes. 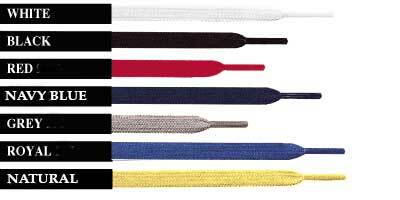 We have been able to locate tubular flat athletic laces in a wide variety of colors. 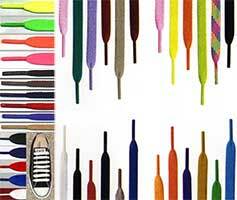 For bargain hunters, we also carry the flat ribbed single layer style, although only in a few colors. You should be able to find a lace length that works for you. For example, a 54" shoelace for your high tops allows you to lace through all eight eyelet pairs and make a normal sized knot, without excess lace when you are done. 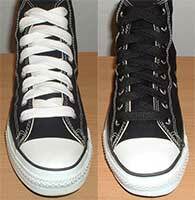 But if you prefer extra long laces for your high tops, you should order 63" laces.